Harrison “Kruise” Pond has been playing competitive Overwatch before the game was even open to the public. 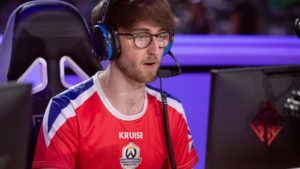 Most known for his Lucio for Reunited, Kruise would then play for eUnited before missing out on the inaugural season of the Overwatch League. After spending a year in the Contenders scene, Kruise is now playing for the expansion team the Paris Eternal. Amanda Stevens caught up with Kruise to talk about how Overwatch has changed over the years, his strength as a communicator, and what it was like missing year one of the League. You’ve been playing competitively in Overwatch since the Alpha, what has it that makes you someone that a team wants to pick up across multiple metas and changes in the game? I think it has a lot to do with communication and being a core part of the team structure. Communication is extremely important in Overwatch because it’s such a teamwork-based game. You need someone to be there to structure how things happen and it can’t be a mess communication wise, you need to have a hierarchy and stick to that. I think just being a leader on a team. You bring up communication, I know that you were talking about your different trials trying to get into Year 1, that it was weird to try and match your communication style with teams that you hadn’t been with. What has it been like being a shot-caller or being part of the communication structure with the Eternal? In Year 1 it was the first time I tried with another team, before that I was always with Reunited and eUnited, and it was really the same core players. So when I trialed with teams like Valiant, they have a lot of Korean players and obviously their English is not as great as native speakers or people from Europe, so we had to really limit what we said and how extensive we would articulate. When I trialed on Valiant the one hour was like yelling targets over and over again and that really surprised me because going from having in-depth calls to “Monkey, Monkey, Monkey” was really weird. Last season I was playing Contenders with Toronto and we had a bunch of Korean players, so I spent a good seven or eight months playing with Korean players. So going from that to playing with Europeans again is much easier, everyone on the team speaks really good English and it feels great. There’s no struggles with communication compared to my last team who didn’t speak much English at all, where my only callouts were “Care me, Care me Kruise, Care me.” That’s it. So it’s good. You brought up eUnited, from what I’ve heard eUnited was both telling their players and other teams that they were already in the OWL, and I know this caused a lot of problems for some of the players because by the time you guys had found out you were not in the OWL a lot of rosters had already been settled. Personally for yourself, how did that whole situation make you feel about your career, because you were doing pretty well on eUnited and then you kinda had to do Contenders for Year 1? I think it’s a little bit more complicated than just that, I don’t even know all the details now. We were told we were essentially in, and I’m sure we were, it was super close to the deadline, apparently it had something to do with someone dropping out last second or something like that. I can’t say for sure, I wasn’t in the room. We assumed we were in the league and planning talking about how things were going to go salary wise. So we were convinced we were in the league and by the time we realised we weren’t a lot of teams had already finished their rosters, for example the London Spitfire who were originally kind of interested in us. We had got business cards at the World Cup in LA, we were having talks like it would be cool. But I was like “No, I’m in eUnited, I love my team, we’re doing super well, we’re a family. No, I’m fine here.” I was turning down opportunities cause I thought I was going to be in the league. When I found out, there were a few teams were trialing still, I could’ve made it in if I played well in the trials but it wasn’t meant to be. I’m in a better situation now and I’m happy for it, so I have no hard feelings. They tried their best, we tried our best and things happen and we got unlucky. You’re very confident talking about your strengths but what do you think is your biggest weakness as a player? Sometimes when I get excited or hyped up I speak a lot faster and some people on the team who don’t understand my accent already, so when I speak fast it’s almost impossible for them to understand. I have to work on controlling that especially in hype moments or playing on stage, I have to keep reminding myself to relax and make sure they can understand what I’m saying instead of spitting words out at a million miles a second. Is there anything else you want to say to your UK fanbase as a sign off? Thanks for the support. It’ll be interesting to see us against the London Spitfire cause I know a lot of the UK fans support them. It’d be nice to see if some of them jump ship and come towards us and support us, and we’ll definitely welcome them. Thank you so much for the support.